Some pictures from the Iowa game yesterday. 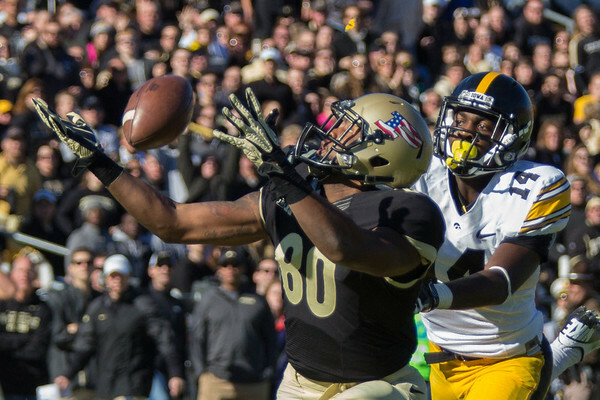 Yesterday I was shooting the Purdue Football game against Iowa. This was a great game for quite a while. In the end though Purdue could not keep up with Iowa. I did have a few plays come my way though during the game. One of them was this deep pass from Danny Etling to DeAngelo Yancey. DeAngelo has given me a couple of good moments so far in his short career with Purdue. With his talent I think that many more are ahead. For this picture I performed a small crop along with a couple of minor adjustments in Lightroom. I love how easy sports images are to edit.